The kitchen is an extremely important area of the home because a large portion of the day can be spent in the kitchen, cooking meals, preparing meals, and eating meals. For this reason it is important to maximize the functionality of our small kitchen ideas to provide the most use and efficiency. 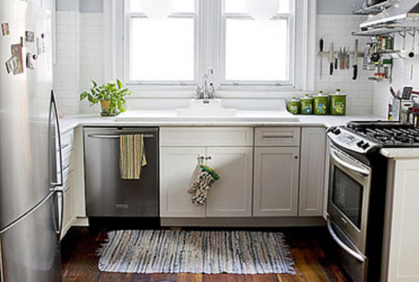 This is particularly important in homes that have small kitchens. 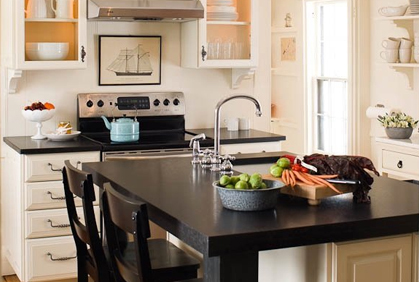 While small kitchens can seem bothersome to navigate, find room for storage, or find enough counter space for food preparation, you can make your small kitchen less crowded and more function using a few simple design tips. 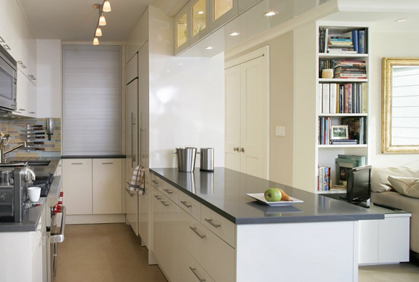 One of the most important factors to consider when redesigning a small kitchen is storage space. A great way to make small room appear larger is to paint the kitchen with lighter shades of color. Light colors tend to brighten up small spaces and create the illusion of a larger space while dark colors can make a small kitchen seem tiny and cluttered. The right type of kitchen lighting ideas can also make or break your kitchen design. You want to make sure your kitchen is well lit to provide adequate lighting when preparing and cooking food, but it is even more beneficial in small kitchens. Floor to ceiling cabinets are ideal for small kitchen design ideas because it maximizes the amount of storage space by utilizing the height of your kitchen. You can also purchase kitchen cabinets that are thinner and not as deep as standard kitchen cabinets; this type of cabinetry is great for small kitchens because they can open up the space and add a little extra area to the floor plan. Another great way to add extra storage space is to install a kitchen island. A kitchen island is an unattached counter that is located in the middle of the kitchen to provide access from all sides. A well designed island layout with cabinets underneath provide ideal storage space as well as extra kitchen countertop space for preparing and cooking meals. A contemporary kitchen design is great to use when redesigning your small kitchen because it uses sleek lines and shapes to create a clean and uncluttered space with maximal functionality. 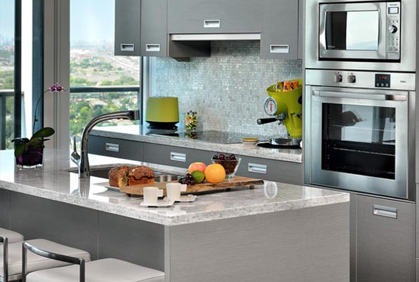 Because small kitchens are contained in such a small area, counter space is usually limited. For this reason you may want to maximize the amount of available kitchen counter space by installing built-in kitchen appliances. For example, an oven can be installed that is either built into the bottom of a kitchen cabinet, or built into the wall. This leaves more counter space available and also opens up the room. 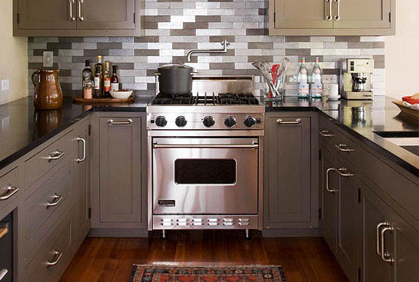 Another way to maximize small room design space is to buy an oven with a stove top; this again can free up both counter and floor space. Well illuminated small kitchen windows can make it appear more spacious than it actually is. Natural light is the best type of lighting to brighten up a room and make it appear larger so try to make the most out of windows in your kitchen floor plan. Kitchen pendant lighting also helps make smaller rooms appear large while focussing attention on relevant design areas. 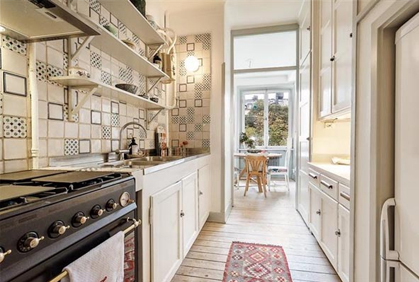 There are many ways to make the most out of your small kitchen designs, you just need to find the type of style and floor plan that work best in your home. A portable kitchen island design has wheels to allow it to be moved from place to place, stored when not in use and moved to the middle of the kitchen when needed. Portable kitchen islands often come in the form of a mobile butcher block. This butcher block cart is not only great to pull out when more counter space is need for food preparation, but also perfect for use as a buffet to serve meals to family and friends. You can also add storage space to your small kitchen by installing hanging hooks above your kitchen island. Hanging hooks can be used to store pots and pans as well as other kitchen utensils that might take up too much cabinet or counter space.